The previous 16 years in the festival took part of 838 musicians from 30 countries. In Símnadcâtíj " UNITY " attending: Enver Izmaylov, Vladimir Solânik, Valentin Korníênko, masha vidrenko and the " Eclectic Sound Orchestra " under the director Sergey Likhomanenko - all from Ukraine. Lithuania Trio "Infiltrators" in the warehouse: Jana Maksimoviča (Saksofoni), Dmitri Golovanova (piano), Arcadia Gotesmana (Drums). Alex Fantaêv (Drums) from Israel and Frode Leopard (Guitar) from Norway. Scandinavian Duet: Swan, tore johanson from Norway and pianist, Lars Ânson from Sweden. Famous Italian pianist and composer from Sicily, author of music to kínofílʹmív - gabríelê dínaro. Young and extremely perspektivne trio from Hungary in the warehouse: Arona Talaša (piano), Josefa Barča Horvata (Contrabass) and attíli guarfaša (Drums). The real opening will become the performance of the Ukrainian ethnic funky band "Shockolad" and American Singer Bria Blessíng. Lead this holiday music will be one of the best šuomenív of Ukraine - Valery Čiglâêv. 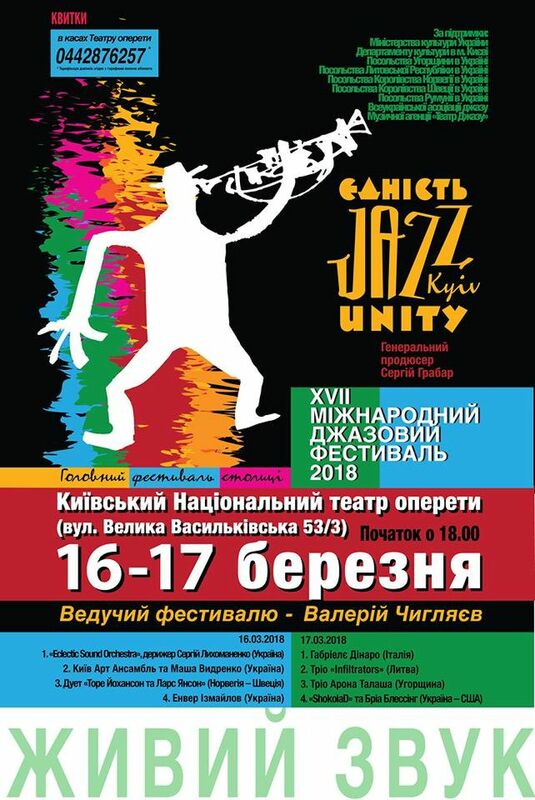 Hvii International Jazz Festival "UNITY" will go to the informational association of jazz.